This book was on my auto-buy list, as all of Lorraine Heath’s books are. I was quite fond of her series before this one, and I soon realized what I was reading was the children of the previous series’ couples. I enjoy this on one level, but on another, I get upset when here and there one of my beloved characters have died off. As they are wont to do in Victorian England without modern surgery and antibiotics. And immortality serum. 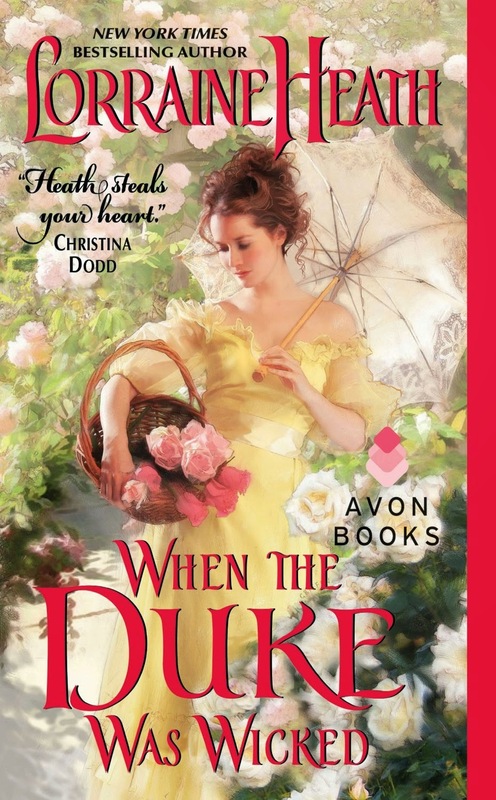 The other thing that annoyed me was that the hero, the Duke of Lovingdon, was acting like a douche canoe. I will grant you, he was entitled to act like an asshat, being that he was a young widower who had greatly loved his wife and child and basically didn’t want to live again, let alone fall in love with anyone else. I could respect that. However, for someone who was hell-bent on never loving again, he was sure doing a fine job of having “moments” with the heroine, who had loved him as a girl and loved him still. It was heartache waiting to happen and I was very annoyed with him. So you know the trope. One of the characters loves the other more, tries to restore the other character to the land of the living. The age old question of: ‘is there only one true love in your life?’ is addressed and remained open for much of the book. He really did love his Juliette; and he really doesn’t want to open his heart to the vulnerability of love again, should love even be an option, which he doesn’t think so. Ms. Heath played me well for 2/3 of the book. I thought the story was just this trope, this question, and nothing more—although she did hint at something in the heroine’s past to make you wonder, was there going to be more. Oh, there was more. There was a LOT more. So then you get to the crux of what Ms. Heath’s book is really about: it’s about living your life after great loss. About how some people withdraw, shut down, are the living dead, while others use the lesson as a means of never letting a moment of life pass without living it to the fullest. I’m not sure I’ve read a historical romance that dealt with this particular twist before. I don’t recall one anyway; and therefore, I’m possibly biased when I think I’m not sure anyone else could do it better or make you believe in the Happily Ever After outcome that finally comes. Just remember when you read this book: there’s more. Hellie Sinclair (a.k.a. Fran) was one of the founding members of the Romance Writer's Revenge, where she frequently got to satisfy her love of good books and her need to expound by writing reviews. Hellie loves to craft on projects she rarely finishes, watch British dramas as a sort of Olympic marathon event, and do most anything that fits the description "indolent and pleasurable." Fortunately reading falls into that category. You can find her at her blog, where she writes the occasional review...and shares updates on her never-ending projects. Hellie, only you could use descriptive swear words in an elegant way, hehe. I always like your reviews and your take on books because your perspective gives me much to think about with stories. I don't know about this book, to be honest with you. I have read books before where the hero deeply loved his first wife, as a hero should. But, this Duke seems to be a tad unapproachable and hard to like? It sounds as if you were satisfied by the end of the book, so I will give it a try. Thanks for your review. I could never take credit for coining "douche canoe" or "asshat"--totally just embraced them once I heard them. Makes it very awkward at performance eval time you know? "My boss is a douche--" Anyway. He comes around; and I really did love how this heroine played out. It's worth reading for the heroine. I know as a reader, I usually read for the hero, but in this case, it's well worth it for the heroine. We should read more for heroines as well. Another great review, Hellie, and another book about which we agree. I thought this one was powerful on several levels, and I loved that it was a second generation tale. Yay! I hope you like it!! I just picked it up the other day. Hope I love it, although I don't like the death of previous characters. I haven't read all of her books, so hopefully it isn't someone I know! I hope so too! *LOL* It's a passing sort of comment. I'm sensitive; I just don't like even hearing that they've died off. I want everyone to live to be at least 100...and I know they weren't that.